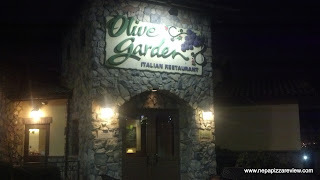 I don't think I need to describe the Olive Garden to anyone because its inevitable that at some point in your life you have experienced their consistently good Italian fare. You've all felt the "when you're here your family" ambiance and probably enjoyed yourself, because the Olive Garden is almost never bad, and almost always good, but not great. I've been a loyal Olive Garden Customer for years, and probably always will be. It was once again date night with the first lady, and I think she wanted to go to a real restaurant instead of a pizzeria so she gently suggested that we go to the Olive Garden - you know, because they also serve pizza! Well, truth be told, I would have went regardless because I never turn down a trip to the O.G. I've been ordering my Seafood Portofino for years, and I looked forward to combining one of my favorite meals with my favorite person, and hopefully a great pizza! Prior to ordering, I found out that my beloved Seafood Portofino had been removed from the menu, so a little part of me died inside before starting the review. With tears in my eyes, I gazed at the pizza menu to find that there are two pizza options for $11.95. First is a pizza with (I'm assuming) unlimited toppings, and the second is the chicken alfredo pizza. We decided on the pizza with unlimited toppings. 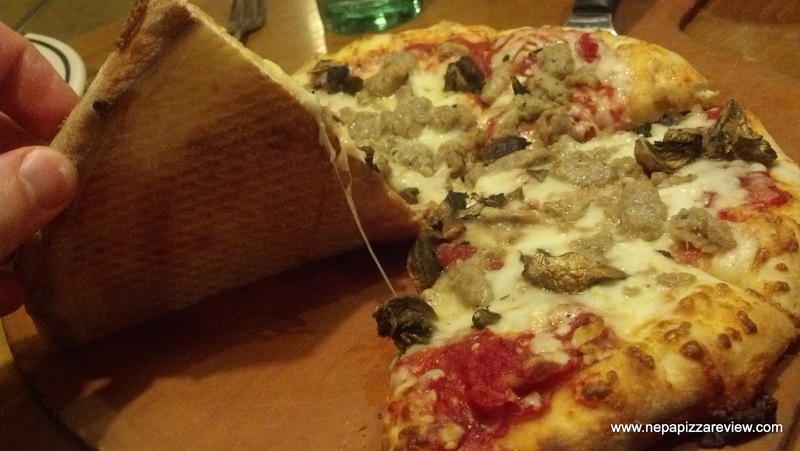 Usually I just go for the plain cheese pizza, but for such a high price, I thought we should try to get our money's worth and opted for sausage and mushrooms. At this price point for a 12 inch pie, I expected a freshly cooked sausage, and some delicious mushrooms, as well as high quality ingredients and a first class pie that was prepared with care and precision. 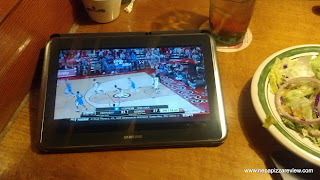 As you can see by the picture, I was able to check out my beloved Kentucky Wildcats on my Samsung Galaxy Note 10.1 while we were waiting! When the pizza came out, my expectations were certainly not met as it was very underwhelming in size, appearance, and composition. When the very friendly and attentive waitress set the pizza down I was immediately aggravated in spending 12 bucks on such a pie. (Before I go on, let me reiterate that we received phenomenal service!) The crust was pretty thick, dense, and had the consistency of a thicker, chewier version of their breadsticks. 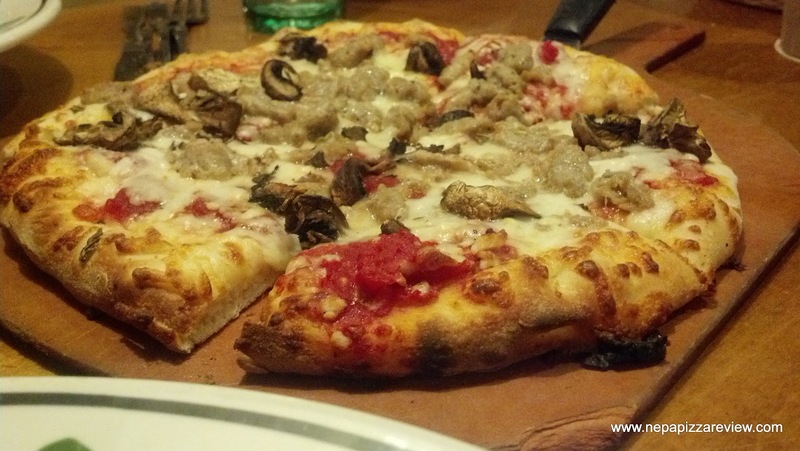 There wasn't much flavor to the dough so it really sapped away what little flavor that the sauce and cheese provided. Also, the crust was under cooked in some areas, but burned in others. In fact, there was a big glob of burned cheese stuck to the underside of one of the slices. The sauce was a simple crushed tomato with very light seasoning, if any. The tomatoes were bitter, cheap, and I think I detected the taste of the aluminum can that they came out of. The flavor of the cheese fell flat as well reminding me of the old Domino's Pizza imitation mozzarella cheese. In fact the entire pie reminded me of the old Domino's pizza recipe which was scrapped for good reason. I thought we said goodbye to that recipe years ago, but perhaps someone dug the retired recipe out of a dumpster and brought it back to life. On top of it all, the sausage was your run of the mill processed meat and the mushrooms had no flavor, but I was glad they were there to introduce at least a little flavor to the mix. If you couldn't tell, I was not happy with this pizza for a few reasons. First, say what you want about the Olive Garden, but they are always consistent, offer great service, and above average food. I went in expecting the same commitment to excellence in their pizza. Second, the huge price tag on this tiny pizza really raised my expectations. And third, I would think that the ingredients that went into this pizza would be much more comparable to the rest of the offerings on the menu. This was not the case. Given, the pie was edible, but I've had better store brand frozen pizzas for a quarter of the price. I would only recommend this pizza if you are dining with children who don't like Italian food and you can satisfy them by paying double the value for a pizza. 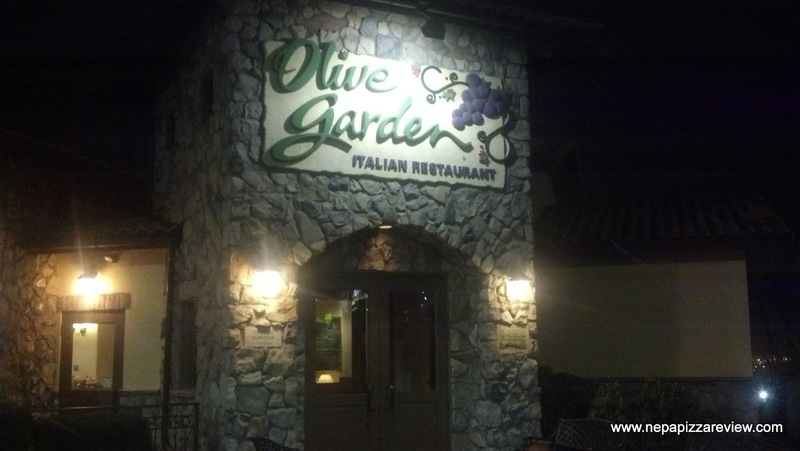 Other than that, I recommend that you stick to the original reason that you went to the Olive Garden in the first place - consistent Italian food, good service, and reasonable prices. Now go grab that Tour of Italy and get on with your dinner! Be sure to leave your comments below! Wow, that is some wretched pizza there. One more reason to avoid chain restaurants. Thanks for the warning! Oh yes it was for sure. Terrible value too. I expected much better. I have a love/hate relationship with chain restaurants...on one hand, the food usually can't match a smaller mom and pop joint whose owner really takes pride in his food and only uses the freshest ingredients, nothing frozen. On the other hand the one thing you can almost always rely on with a chain restaurant is consistency. I know that the 'tour of italy' (if they still have that) will be just as good today as it was near AC a couple years ago, the last time I had it. Consistency goes a long way with me, so I'm fine with a chain restaurant, especially if I'm out of town and are not familiar with the local restaurants.